All told they're not without limitations, but at just over £250 a pair, these monitors will no doubt find their niche. Great, detailed mid-range. Compact. Good connectivity. Excellent construction and finish. Results vary greatly depending on proximity to wall and there's no way to compensate. 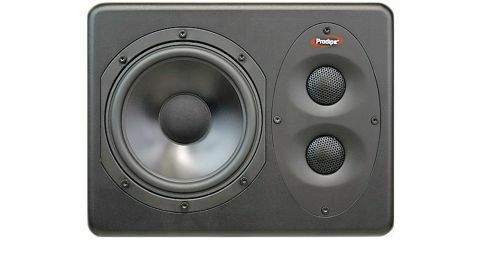 Prodipe's Pro 6 monitor is a budget bi-amp (90 Watts) nearfield. Each unit combines a 6.5-inch black aluminium cone with two 1-inch silk dome tweeters. Connectivity is good (TRS jack, XLR and RCA phono) and further rear panel controls include volume (-30-6dB) and HF adjustment (+1, 0, -1 and -2dB shelving at 2kHz). "It has good low-end extension and crisp, detailed mid range"
It includes rear ported bass reflex, so it's important to keep it away from a rear wall, and the cabinet design allows both vertical and horizontal orientation. Each speaker is compact and fairly heavy (9kg), and construction and finish are excellent. Twin tweeter loudspeaker designs are rare, in part down to the potential for a compromised off axis response. Alas, the Pro 6 does suffer here, and the speaker orientation dictates whether this is worse as you move vertically or horizontally away from the sweet spot. Nevertheless, it has good low-end extension and crisp, detailed mid range. The HF control allows for some tweaking (we preferred it at -1dB), but it's a shame there's no LF compensation for wall proximity.